It’s intoxicating for a man to be waited on. Combine this with very, very skillful s*x, and that will get them. Millionaires are marrying their secretaries because they are so busy making money they haven’t time to see other girls. To make a long story short, there’s nothing like having a boss walk in. Doris Lilly was born in South Pasadena in California, USA. She was an American newspaper columnist and writer. 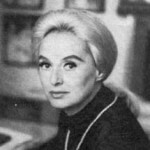 She wrote newspaper columns on high society for the New York Post between 1968 and 1978, and the New York Daily Mirror. The title of Lilly's first book, How to Marry a Millionaire was adapted for a film of the same name starring Marilyn Monroe and Ava Gardner. She was a socialite and wrote several books about people of great wealth including Glamor Girl and Those Fabulous Greeks: Onassis, Niarchos and Livanos.